The First Joyful Mystery of the Rosary. 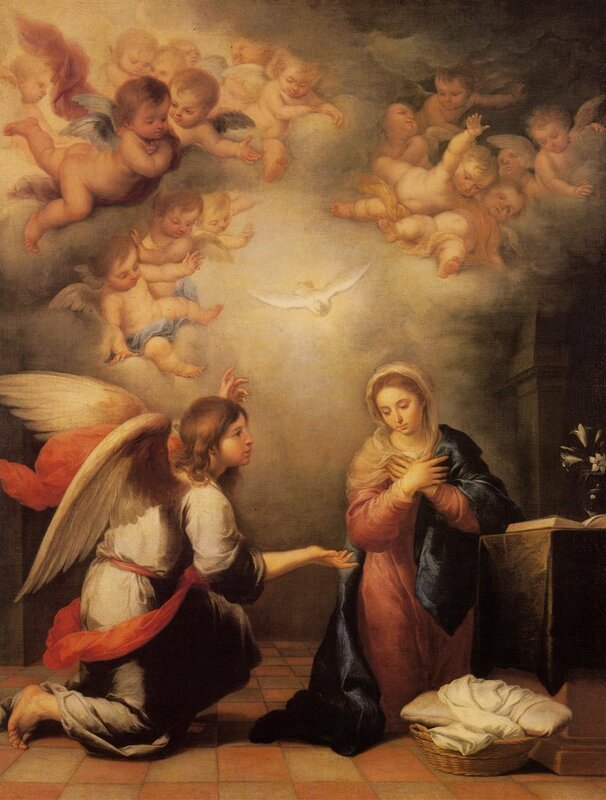 Today the Church celebrates that day when the Archangel Gabriel requested Our Lady to be the Mother of God. Mary accepts and declares herself to be the handmaid of the Lord. Now, dear child, listen to Me: how much you should take to your heart doing the Divine Will and living of It! My power still exists: let Me pronounce my Fiat over your soul. But in order to do this, I want your own. One alone cannot do true good; the greatest works are always done between two. God Himself did not want to do it by Himself, but wanted Me together with Him, to form the great prodigy of the Incarnation. In my Fiat and in His, the life of the Man-God was formed; the destiny of mankind was restored, Heaven was no longer closed, and all goods were enclosed between the two Fiat. Therefore, let us say together, “Fiat! Fiat!”, and my maternal love will enclose in you the life of the Divine Will. Day Twenty The Queen of Heaven in the Kingdom of the Divine Will. Now listen, dear child, to the point one can reach, when the Divine Will takes operating life in the creature, and the human will lets It work, without impeding Its step. This Fiat, which by nature possesses the generative virtue, generates all goods in the creature: It renders her fecund, giving her maternity over all – over all goods, and over the One Who created her. Maternity says and means true love: heroic love – love which is content with dying to give life to the one it has generated. Without this, the word maternity is sterile, it is empty, and is reduced to a mere word, but does not exist in fact. Therefore, my child, if you want the generation of all goods, let the Fiat take Its operating life in you, which will give you maternity, and you will love everyone with the love of a mother. And I, your Mama, will teach you how to fecundate this maternity, all holy and divine, within you. While praying, I was fusing all of myself in the Divine Will, and my sweet Jesus came out from within my interior, and throwing His arm around my neck, told me: “My daughter, with Her love, with Her prayers, with Her annihilation, my Mama called Me from Heaven to earth, to incarnate Myself in Her womb. You, with your love, and with your continuous dissolving of yourself in my Volition, will call my Will to have life on earth within you; and then you will give Me life in other creatures. However, know that as my Mama called Me from Heaven to earth inside Her womb, since the act She did was a unique act, which will never be repeated again, I enriched Her with all graces. I endowed Her with so much love as to make Her surpass the love of all creatures united together. I gave Her primacy in the privileges, in the glory – in everything. I could say that the whole of the Eternal One reduced Himself to one single point, and poured Himself upon Her in torrents, in immense seas; so much so, that all remain below Her. Forty years and more of exile; virtue and strength of a prolonged sacrifice. Gathering of the materials, to then order them. Happiness of Jesus in blessing His little prisoner daughter. Kisses in the Divine Will. Decision from priests to prepare the writings for printing. Surprising graces that Jesus will give to priests. … After this, He kept silent. Then, with a more tender emphasis, He added: “My daughter, if you knew the ardor of my love that I feel, because I want to establish the Kingdom of my Divine Will upon earth, so as to realize the only purpose for which man was created. In fact, in everything that has been done by the Divine Persons, from the time when the world was created, and in what We will do, Our principle will always be that one, nor will We ever cease it: that man return into the inheritance of the Kingdom of Our Fiat, which he rejected from Us. This is so true, that in my very Incarnation, when I descended from Heaven to earth, the first purpose was the Kingdom of my Divine Will; it is into Its Kingdom – that is, in my Immaculate Mother who possessed It – that I directed my first steps; my first dwelling was within Her most pure womb, in which my Fiat held Its absolute dominion and Its Kingdom, whole and beautiful. And in this Kingdom of my Will which my Celestial Mama possessed, I began and I formed my life down here – made of pains, of tears and of expiations. I knew that I was to be the Jesus neglected, unloved, nor sought for, but I wanted to come because I could see through the centuries how my coming upon earth was to serve to form the Kingdom of my Divine Will and, by necessity, I was to redeem them first in order to obtain my first purpose. And so, even from that time, I descended from Heaven in order to come to find, to search for and to clasp to my breast the children of my Kingdom, who would search for Me, love Me, recognize Me, to the point of being unable to be without Me. Therefore, in what I did and suffered, I put a mark and I said: ‘Here I shall wait for the children of my Will; I shall embrace them, we shall love one another with one single love, with one single Will.’ And for love of them, my pains, my tears, my steps, my works, changed for Me into refreshment, into joy for my Heart drowned with love. The love and the desire I feel to make It known is so great, that if it were necessary I would incarnate Myself again in order to obtain that my Will be known and that It reign upon earth. But this is not necessary because, having incarnated Myself once, my incarnation is always in act, and has the virtue of reproducing the same effects as if I were incarnating Myself again. And it was only for the decorum of my Fiat that I chose you, I purified you of any seed of corruption, I enclosed Myself in your soul – not only in a spiritual way, but also in the natural – so as to make use of you as a veil to cover Myself, almost as I made use of my Humanity, as a veil to hide my Divinity. And in order to have you at my disposal, I segregated you from everything, I confined you inside a bed – and for so many years, to give you the sublime lessons about my eternal Fiat, and to make you drink, sip by sip, Its knowledges and Its Life. Its long story required time, in order to narrate it to you and make you comprehend it. I can say I have done more than in Creation and Redemption, because my Will encloses both one and the other, It is origin and means of them, and It will be end and crown of Creation and Redemption, in such way that, without my Will, unknown and not reigning and dominating upon earth, Our works would be works without crown and incomplete. And so, this is the reason for so much interest in making It known. Our very works, done with so much love and magnificence, are in the nightmare of an unutterable moan, and almost of a profound humiliation, because the Life, the essential substance which they hide, is not yet known. The veils, the exterior of Creation and Redemption are known, but the Life which they hide is ignored. How can they give the Life they hide and the goods they possess? Therefore, Our works long for – demand their just rights: that my Divine Will be known. Ah! yes, It alone will be the glory, the everlasting crown and the fulfillment of Our works. And so, my daughter, here is the first step of the parallel between Me, Divine Word, when I descended from Heaven, and my Divine Will that takes Its first step to come to reign upon earth. Just as I directed my first steps toward the Virgin Mother, so did my Will direct Its first steps in you; and as It asked for your will and you surrendered it, It immediately formed Its first act of conception in your soul; and as It manifested Its knowledges, giving you as though many divine sips, It formed Its Life and gave start to the formation of Its Kingdom. But, for a long time, who knew anything? No one; only you and I were aware of everything; and after some time my representative, the one who directed you, became aware of what was happening in you – symbol of my representative, Saint Joseph, who was to appear as my father before creatures, and who, before I came out of the maternal womb, had the great honor and gift of knowing that I was already in their midst. After the first steps I took the second: I went to Bethlehem to be born, and I was recognized and visited by the shepherds of that place. But they were not influential people, they kept for themselves the beautiful news that I had already come upon earth, therefore they did not occupy themselves with making Me known, with spreading Me everywhere, and I continued to remain the Jesus hidden and unknown to all. But, though unknown, I was already in their midst – symbol of my Divine Will: very often other representatives of mine have come to you, from afar and from nearby, who have listened to the beautiful news of the Kingdom of my Divine Will, the knowledges about It, and how It wants to be recognized. But, some for lack of influence, some of will, they did not occupy themselves with spreading It, and It remained unknown and ignored, even though It already exists in their midst; but because It is not known, It does not reign – It reigns only in you, just as I was only with my Celestial Mama and with my foster father Saint Joseph. So, one who lives in Our Divine Will is the repeater of Our works, because just as nothing in the Creation has been dispersed of what was created, so is everything of Redemption in act of arising continuously. But who gives Us the spur? Who gives Us the occasion to move Our founts in order to renew Our works? One who lives in Our Will. By virtue of It, the creature takes part in Our creative strength, therefore she can make everything rise again to new life. With her acts, with her offerings, with her supplications, she moves Our founts continuously, which, moved as though by a pleasant breeze, form the waves, and overflowing with Our acts, multiply and grow to infinity. Our founts are symbolized by the sea: if the wind does not agitate it, if the waves are not formed, the waters do not overflow outside and the cities do not get wet. The same with Our founts of Our so many works: if Our Divine Fiat does not want to move them, or if one who lives in It gives no thought to forming any breeze with her acts, even though they are filled to the brim, they do not overflow outside to multiply their goods for the good of creatures. I am beneath the press of the privation of my sweet Jesus, I feel pressed, undone, as if my life might want to finish, but the Divine Volition triumphs over my little being rising in my soul, and calls me to make my day in his Will, it seems to me that while I feel myself die without dying, He forms his victory and it is his triumph, and his life re-arises over my dying will more beautiful, all full of Majesty and double love. Oh! Divine Will, how much you love me, you make me feel death in order to centralize your life all the more in me. “My blessed daughter, my love was so much in incarnating myself in the bosom of my Celestial Mother that Heavens and earth could not contain it, the act of incarnating myself happened in one act of love so intense, so strong, so great, that it was more than enough to burn everything and everyone with love. You should know, before incarnating myself my Celestial Father looked in himself and in the enthusiasm of his love not being able to contain it seas of love went forth from himself in torrents, in this enthusiasm of love he looked at his Son, and I found myself in the same flames of love and I commanded myself that I might incarnate myself, I wanted this, and in an impetus of love, without my Father leaving, nor the Holy Spirit, the great portent of the incarnation happened. I remained with my Father, and at the same time descended in the bosom of my Mother. The three Divine persons we were inseparable, nor subject to separate ourselves. Therefore I can say: I remained in Heaven, and descended in earth, and the Father and the Holy Spirit, they descended with me in earth and they remained in Heaven. Hence in this act so great our Divine Being overflowed so much in love, that the Heavens were stupefied and the Angels surprised and mute, everyone wounded in our flames of love. The incarnation was none other than an act of our Divine Will, what doesn’t he know how to do and can do[?] everything; with his power and with his infinite love he arrives, even to work the prodigy not ever heard of, nor done, of making us remain in Heaven and descend in the prison of the Maternal bosom. Thus our Will wanted thus it was done. “Hence every bird, some trilled love, some chirruped, some warbled love, even every atom of earth was invested by her love, the breath [fiato] of the beasts came with the ‘I love you’ of my Mother, the hay was invested by her love, therefore there was no thing that I might see or touch, that I might not feel the sweetness of the love of Her. With this she prepared for me the most beautiful feast, in my birth, the feast all of love, was the exchange of my great love, that made me find my sweet Mother, and it was her love that quieted my weeping, warmed me while in the manger I was numbed by the cold; more so that I found in her love the love of all creatures, and for every one she kissed me, squeezed me to her Heart, and loved me with (the) love of Mother for all her children, and I feeling in every one her Maternal love, I felt myself love them as her children and as my dear brothers. “My daughter, what can not love do, animated by an Omnipotent Fiat? It makes itself magnet and attracts there in an irresistible way, removing every dissimilarity, with its heat it transforms and confirms He whom it loves. Then it embellishes in an incredible way, as to feel Heavens and earth enraptured to love. To not love a creature that loves us proves impossible, all our Power and Divine strength, are rendered impotent and weak before the winning strength of whom loves us. Therefore you also give me the feast that my Mother gave me in being born, involve Heaven and earth with your ‘I love you oh Jesus’, let nothing escape you if your love doesn’t race, make me smile, because I was not born one single time, but I am always reborn, and many times my rebirths are without smile and without feast and I remain alone (with) my tears, the hiccups, the whimpers and a cold that makes me tremble and numbs all my members. My beloved Jesus, as if inundated in His sea of Love which forms Its waves, surprising me said: “My blessed daughter, in my descent upon earth the wonders – the ardor of our Love – were so great and so many that neither Angels nor creatures can understand all that our Divinity operated in the mystery of my Incarnation. You must know that our Supreme Being possesses Its incessant motion by nature. If this motion could cease, even for an instant – which cannot be – all things would remain paralyzed and with no life, because all things – the life, the preservation and all that exists in Heaven and on earth – everything – depends on that Motion. Therefore, in descending from Heaven to earth, I, Word and Son of the Father, departed from our primary Motion; I mean – remaining, I left. The Father and the Holy Spirit descended with Me – they were concurrent (neither did I do any act if not together with Them), and they still remained on the Throne – full of Majesty, in the Celestial regions. Now, having completed my office down here, I left for Heaven, remaining imprisoned inside each Sacramental Host. Do you know why? Because my Love, being my sweet imprisonment, told me: ‘The purpose for which you descended from Heaven to earth is not accomplished. Where is the Kingdom of our Will? It does not exist, neither is it known. So, remain there as a Prisoner in each Sacramental Host. In this way, there will not be only one Jesus, as in your Humanity, but a Jesus for each Sacramental Host which will exist. In a fury of love, your many Lives will make a way to the Divinity, as well as in each heart which will receive You. These Lives will have a little word to say to make our Will known, because when they descend into each heart, they will not be mute, but speaking, and You will speak about our FIAT in the secret of their hearts. You will be the Bearer of our Kingdom.’ I recognized the demands of my Love as just, so I remained willingly on earth in order to form the Kingdom of my Will – until the complete fulfillment of the work. You see, by departing for Heaven while remaining on earth, my Life, spread in many Sacramental Hosts, will not be useless down here. I will certainly form the Kingdom of my Will. I would never have stayed if I knew I wasn’t going to obtain the intent; more so, since this is for Me a sacrifice greater than my very mortal Life. How many secret tears, how many bitter sighs in the midst of many devouring flames of love! I would like to devour all souls inside my Love to make those who are going to live in my Divine Volition rise again to new Life. This Kingdom will come from the center of my Love. It will burn the evils of the earth, relying upon Itself and arming Its Omnipotence; so, victory after victory, It will win our Reign in the midst of the creatures, to give It to them. My Celestial Father had to find in Me as many of my Lives for as many creatures He had given, and was going to give to daylight, in order to be satisfied, glorified and repaid for His great Love. Although not everyone would take this Life of mine, my Celestial Father demanded my Life in order to be glorified for everything He had done in the Work of Creation and Redemption. I can say that, as soon as man subtracted himself from my Will, the Glory which was due to my Divine Father ceased. So, if I didn’t form from Myself one Jesus for each existing creature, the Glory of the Celestial Father would have been incomplete – and I can not do incomplete works. My Love would have waged a war against Me, if I hadn’t formed of Myself many Jesuses – first, for Our own decorum and Glory, and then, to give this complete good to each creature. Jesus kept silent. I remained with the scene before my mind, of so many Jesuses for as many existing creatures. But I had a thorn in my heart which tortured me and embittered me – down to the marrow of my bones – for a person very dear to me, and necessary to my poor existence, who was in danger of death, and I wanted to save this person at any cost. Therefore, I took the Divine Will, I made It all mine, and in my pain I said to Jesus: ‘Jesus, Your Will is mine. Your Power and Immensity are in my power. I don’t want it, so neither You must want it.’ My God, I felt as if I were battling a Power; and in order to win, my mind had brought itself before the Divinity, while I was placing around It the expanse of Heaven with all the stars in prayer, the vastness of the light of the sun with the force of its heat, the entire Creation – in prayer; and also the seas of Power and Love of the Queen of Heaven, the pains and the Blood shed by Jesus, like many seas around the Divinity – all in prayer; and then the many Jesuses for each creature, so that they might give a sigh – a prayer, to obtain what I wanted… But what was not my surprise and commotion together, in seeing and hearing that the many Jesuses of all the creatures prayed to obtain what I wanted? I remained confused in seeing so much goodness and divine compliance. May He always be thanked and blessed. And may all be for His Glory. My mind, my poor mind submerged in the Divine Fiat never tired of contemplating the conception of the Immaculate Queen. When the Fiat accomplished this act He was exultant and He called around Him to Himself the Angels, Saints, creatures, the entire creation, so that they all could witness the graces and love with which He produced from nothing this sublime creature. “To make Me descend from Heaven, it was necessary that this Celestial Creature should possess all the prerogatives, virtues, and beauty that were proper to the Word of the Father. To be able to be conceived and incarnated in her womb, I had to find in Her my Heaven and my Sanctity. I had to see Her sprinkled with my own Blood, and enriched by the Divine Fecundity of my Will-while She would form my Life of Son of God and Son of Man. “My daughter, take courage. I shall help you. I myself will suggest the words to you because I feel the irresistible urge to make my Mother known to all, her gifts, her privileges, and the great good that She does and can do for all human generations. Listen and learn how far our Love reaches. You will hear things never heard by you, nor by others, marvels that will shake the most unbelieving and ungrateful sinners. “In such a way, by means of this human and Celestial being, the barrier that existed between God and man were removed. When one approached the other She gave to her very children the brother that all could love. Mirrored in Son and Mother, creatures same human failings had experienced such confidence and love [so as] to be conquered-and [they] loved with rapture He who loved them so, and [who] led a common life with them. “If a good mother earns from her own children veneration and love, how much more [veneration and love] does this Celestial Mother deserve who did not hesitate to risk her own life so that her own children could be saved. What is it that She did not do to make them happier and holy? The humanity of the Son of God is his Celestial Mother, and as human is true motive for trust and love for all generations. “But this is still nothing. I was God and had to do as a God. Our Love flowed and flowed. At first you will be stupefied by the new findings that I uncovered to satisfy my excessive tenderness. When at their time the human generations will learn about it, they also will remain surprised-and they will love Us so that they will reciprocate to a great extent the unbridled flow of our Love. Therefore give Me your attention, my child, and thank Me for what I am teaching you. “This Celestial Queen possesses the fullness of our Divine Fiat, which in [Its] Nature possesses the virtue of generation and bilocation. Because of this She could generate and bilocate as many times as her God Son desired. Whereupon our Love-having been placed in this Celestial Creature, and given deliriously by virtue of my Fiat that She possessed-gave Her the power to allow Her to generate Jesus in each creature. To make Him be born, grow, and do everything necessary to form the Life of her dear Son, and, after this Life was formed, to supply that which the creature does not do for his Creator. Accordingly . . . if He cries in Her, She dries his tears; if He is cold, She warms Him in her own way; if He suffers, She suffers suffer together with Him. The Supreme Being, When He Willed the Incarnation of the Eternal Word in the omb of the Celestial Queen, Entrusted to Her the Task of Carrier of Souls to Jesus. “For those who do not heartily tell Him ‘I love You’ when they receive Him, I dispose to love Him in their stead. For those who receive Him distracted, without thinking of the great Host that they are receiving, I pour myself out to Him so as not to allow Him to feel the distractions and coldness of creatures. For those who almost make Him weep, I dry his tears, I soothe Him, and at the same time scold those creatures so [that] they will stop making Him sad. On November 20, 1994, on the Feast of Christ the King, in the main church, Archbishop Carmelo Cassati, in the presence of a large crowd including foreign representatives, officially opened the Cause of Beatification of the Servant of God, Luisa Piccarreta. July 3,1963 – Her mortal remains were definitively laid to rest in Santa Maria Greca. November 20, 1994 – Feast of Christ the King: Archbishop Carmelo Cassati officially opened the Beatification Cause of the Servant of God Luisa Piccarreta in the principal church of Corato, in the presence of a huge crowd of people, locals and foreigners.